Quitting smoking can be frustrating, a battle you have with yourself. It may take several failed attempts for a quitter to finally be able to stay off cigarettes. Many ex-smokers agree that quitting smoking was the most difficult thing they have ever done. However, they have still managed to be successful at it. If they can do it, so can you. As you prepare to quit, it is important to list down your personal reasons for quitting. This list will motivate you to stay on track. Whatever your reasons, however long or short the list, you will see improvement in your life and yourself beginning as soon as 20 minutes since your last smoke. When a strong craving hits, it can be easy to lose your focus, remember that you are not alone, keeping yourself prepared by building a strong support system can make your quitting journey a lot easier. Involve your friends & family in your journey: Whether it is your wife, mother, husband, or friend make sure they know you have taken the decision to quit smoking. Involving people like family or friends will make you feel conscious of your smoking habits. You can share your goals with them and ask them to help motivate you to stay on track. This way, you can even celebrate milestones together. If you have friends who smoke and that’s making it difficult for you to quit, it might be time to distance yourself till you feel confident enough to control your urges to smoke while spending time with your friends. Find a quit buddy: Support is a two-way street. If you want others to be there for you, you need to be there for them too. 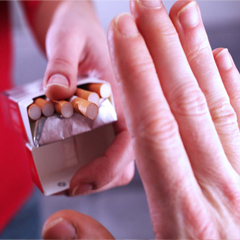 A quit buddy is someone who is in the process of quitting or who has recently quit smoking. You can have common goals, discuss your cravings, coping strategies, withdrawal symptoms, help each other stay on track and keep each other motivated. You can also plan smoke-free nights to keep yourselves distracted. Join an online support group, program, or discussions on quitting: There are many interactive, web-based services available where you can have access to Quit Plan exercises and tools to help you better understand your smoking. It will help you keep track of your progress and measure your success. Support groups or discussions allow you to express your feelings with others who understand. You learn ways that have helped others quit for good. You can share your experiences, gain inspiration and support from others to help and strengthen your commitment to quit. There are also various apps that can help you quit smoking, offer up the virtual support you need to kick your habit for good, so help is in the palm of your hand. Speak to a professional: You might like to solve problems on your own, but the truth is we all need a little help from time to time. If you find yourself unable to build support, a trained professional can deliver information, advice, and provide support, this in turn can double your chances of quitting. Studies showed that telephone counseling is an effective smoking cessation support. Not sure how to ask? Send a text, email, or call to get the conversation started.